The only team on this list that didn’t actually win the World Cup, Hungary was absolute favorites coming into the 54’ tournament, as they could count on the service of two players still considered amongst the best to ever play – Ferenc Puskas and Sandor Kocsis. Things began incredibly, as the “Magic Magyrs”, as they were known, destroyed South Korea 9-0, and a B West German team (who were reserving their best players for later in the tournament) 8-3 to qualify from their group. They then beat Brazil and Uruguay to reach the final against West Germany. After strolling into a 2-0 lead, the cup seemed Hungary’s. But the West Germans came back to win 3-2 in one of the big World Cup shocks. Italy has won four World Cups overall, but their finest moment came in the third World Cup when they were able to defend their 34’ title. 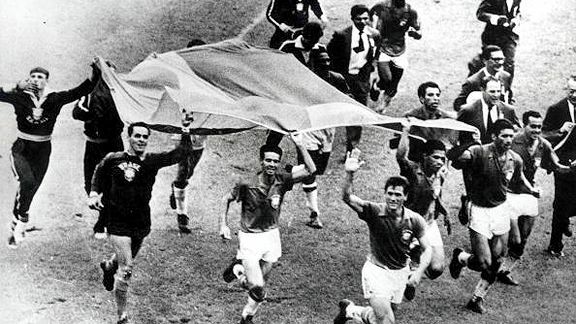 This feat was only matched once, by Brazil, in 1962. In the early days of the tournament, a team only had to win four matches to be crowned world champions. 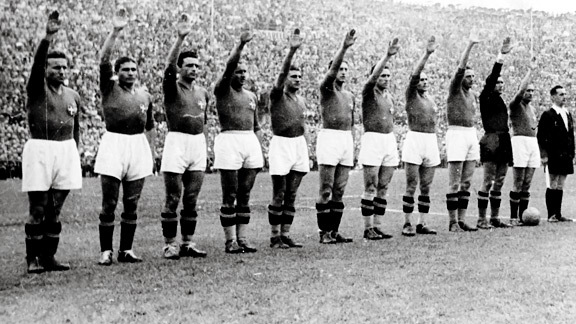 Italy accomplished this by edging Norway 2-1 after extra time, before beating three of the world’s toughest teams in succession, France, Brazil, and Hungary, to win the cup. The tournament would not be held for another 12 years due to World War II. The 1990 World Cup, hosted by Italy, is actually known as one of the worst in history, as it has a record low goalscoring average of 2.21 per match. The Germans actually contributed many of the tournament’s goals in their first two matches, 4-1 and 5-1 defeats of Yugoslavia and United Arab Emirates, respectively. They then surprisingly drew 1-1 with Colombia, but hit their stride in the knockouts, as they edged Argentina and Netherlands, before surviving penalties against hated rivals England in the semifinals. They would go on to beat Argentina 1-0 to become World Cup winners. Despite inventing soccer, and being a soccer-mad nation, England has only won one World Cup – the 1966 edition, which they hosted. It started unceremoniously, with a 0-0 draw against Uruguay, before they beat Mexico and France to finish first in their group. Wins over Argentina and Portugal set up a mouth-watering final clash against West Germany, who had cruised through the tournament. That match is still known as one of the greatest finals in history, as England won 4-2 after extra time, with a controversial goal from Geoff Hurst still being argued to this day. Spain, known as underachievers in the world’s biggest sporting event, finally won their first World Cup in 2010, and broke several records along the way. Their journey began in the worst way possible, however, as they were left stunned after losing 1-0 to minnows Switzerland. After rebounding to beat Honduras and Chile, they became the first team to not concede a single goal in the knock-out stages, as goalie Iker Casillas was in amazing form. Portugal, Paraguay, favorites Germany, and finally Netherlands were all beaten 1-0, as the Spanish also became the first team to win a World Cup after losing their opening match. The 1986 World Cup is famous for one man – Diego Maradona. He didn’t immediately make an impact, as he only scored one goal in the group stages – in a 1-1 draw with Italy. But, he showed what he could do in the quarterfinals against England when he scored two of the most famous goals ever. First, he punched the ball in the net, with the “Hand of God”, but somehow the referee missed it and awarded the goal. Maradona would then go on to score the “Goal of the Century”, as he dribbled past six English players to score. Argentina would go on to defeat West Germany in the final, and Maradona won the Golden Ball award for best player. Just like 86’ was Maradona’s tournament, 58’ was Pele’s. However, he only played his fist match in Brazil’s last group stages match, against the Soviet Union. He would then go on to score in the three knockout matches, including a hat-trick against France in a 5-2 win in the semifinals. Two more goals in the finals against Sweden, which Brazil also won 5-2, would set him up to be named on the World Cup’s all-stat team and to go on and become a household name. Ronaldo is the World Cup’s all-time top scorer, with 15 goals to his name. 8 of those came during the 2002 World Cup, in which Brazil set a record for the highest overall goal difference for a champion (+14). After cruising through an easy group which included Turkey, Costa Rica, and China, Brazil came up against their first tough opponent in the shape of England in the quarterfinals. They were able to come from behind to win that, and then edged Turkey for the second time. In the finals, they faced a favored Germany and eased to a 2-0 victory, with Ronaldo fittingly scoring both goals, which came in the second half. Anticipation was high coming into the 98’ tournament for hosts France, who had never won the World Cup. Big wins over South Africa, Saudi Arabia, and Denmark only increased the excitement. Paraguay surprisingly took the French to extra time in the Round of 16, and only a late golden goal saw them through. It went even closer in the quarterfinals, as only penalties helped France beat Italy. The semifinals were also close, as France had to come from behind to beat Croatia, who had stunned the world during the tournament, 2-1. But in the final, they thrashed Brazil 3-0, in one of the most impressive performances ever. Not only is the 1970 World Cup, which Mexico did an amazing job of hosting, considered the best in history, the Brazilian team is also the finest to ever play in the World Cup. Not only did it feature Pele, in his last World Cup, but also Carlos Alberto, Jairzinho, and numerous other famous Brazilians. They got maximum points in a tough group consisting of Czechoslovakia, Romania, and England. In the knockout stage, the amazing Brazilians continued to score goals freely, defeating Peru 4-1, Uruguay 3-1, and in the final, Italy 4-1. It was an incredibly dominant display throughout the tournament, and one that may never be repeated again.